Learn effective ways to use Social Marker and get to know some of the social bookmarking sites. 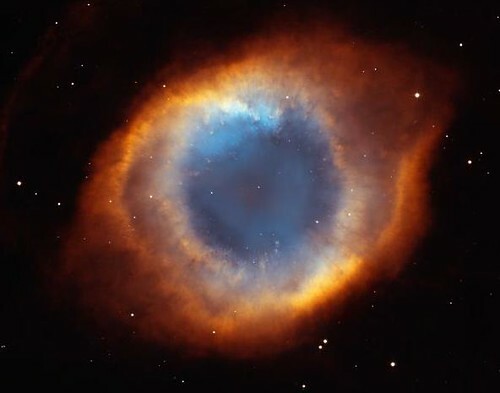 Then submit your blog post to various bookmarking sites like Del.icio.us, Twitter and StumbleUpon. There are many others – but it’s a good idea to make sure that the content you want to bookmark fits some of the other sites. 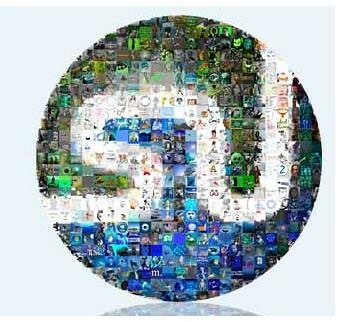 Social Marker – Click here to start using Social Marker. Go ahead and add the Social Marker button to your toolbar in Flock/Firefox. 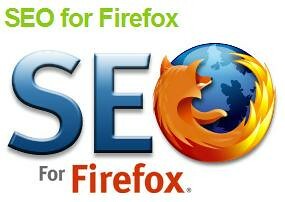 It will speed up the process by importing some of the web page details for you. I don’t want to knock on any specific person or job – but one of the most prevalent stereotypes involving salespeople is the “used-car salesman.” The image brought to mind is the guy sitting across the table – being pushy, trying to close the deal – overcoming the objections – and creating urgency by limiting the time the price is valid. I’ve met car salesmen who truly seemed to have my interests in mind. I’ve also come across a few who were out to sell me a particular car. They sized me up and decided what they wanted to sell me before I even had a chance to tell them what I wanted or what I could afford. In those instances, it felt adversarial – their intent was to line their pocket, not serve their (potential) customer. An emergent sales approach in the last decade or two involves taking on the role of consultant or advisor. It means asking a lot of open ended questions, finding out what a customer is looking for, what they need. An advisor wouldn’t try to push any certain product or agenda – rather, through conversation – they would begin to work out a solution that is the ideal fit for the customer’s problem. In one sense, it takes more work – more of an investment on the salesperson’s part to make sales this way. But if done well, if the salesperson has used conversation to connect with their client – to assess the problem and come up with a solution – the end result is a customer who trusts you, who is ready to make their purchase and will remain a satisfied customer. It’s this idea of conversation Ed is talking about here. The conversation can now happen online. And that is the power of services like Twitter and Friendfeed. You get to have those conversations with potential customers. You get to create those relationships, and become known as a problem solver. Solve enough problems for enough people – the money will follow. One of the key concepts to keep in mind – it’s not about the volume of content Friendfeed sends out – it’s about the ability to create conversations around bits of content. This is where Friendfeed excels as a conversational platform. By the way, the use of the word “conversation” here implies a two-way communication. People try to do this with Twitter, but Twitter isn’t designed as a conversation platform – like Instant Messaging or Skype. It’s a micro-blogging platform – designed around the idea of short, 140 character posts. People try to use it as a two-way conversational tool – and it can sort of work that way. But at the core, that’s not what micro-blogging is meant to accomplish. Friendfeed takes any piece of content and provides a mechanism to filter and stream that content – allowing people to vote and/or comment on it. It doesn’t “generate” the content per se – it gives you a place to gather or aggregate this content from several sources, turning it into a feed – and then turning it into a conversation. 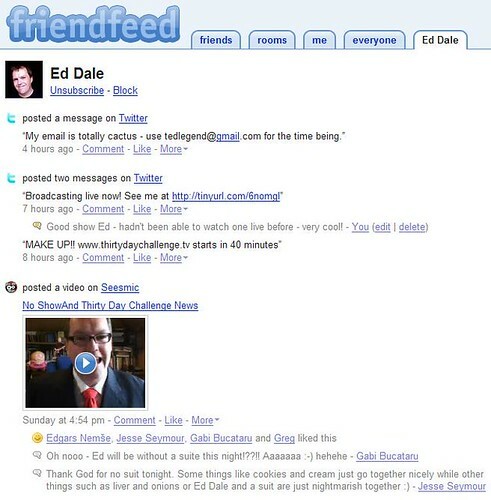 If you follow Ed on Friendfeed, you’ll see just about everything Ed is doing online. It could be a new picture on Flickr, a new video on YouTube, a new blog post, his latest “Stumble” – etc. It’s been referred to as a “Life-streaming” application. When it’s all said and done – the more times you are able to communicate to your market in a non-threatening way – without getting in their face with a “hard-sell” – the more successful you will be. The more times you’re able to make contacts, build rapport and get your offer in front of them – and they can respond to you – the more likely you will be to make sales and the more successful you will be. In this regard, Twitter and Friendfeed are two of the most powerful tools currently available for opening up the conversation and allowing online business people to interact with their potential customers. 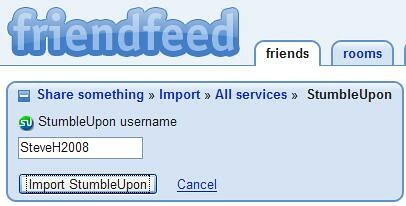 Step 2 – Find your friends – here, we can find Facebook friends and/or import our address book. 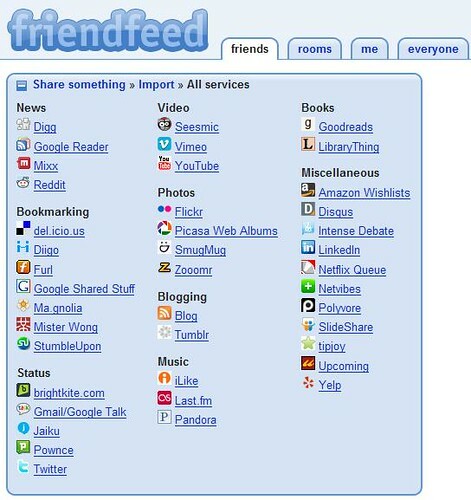 Friendfeed is a great way to keep your Facebook news feed up to date. It’s a bit advanced for today, but it’s something we’ll want to look at later. 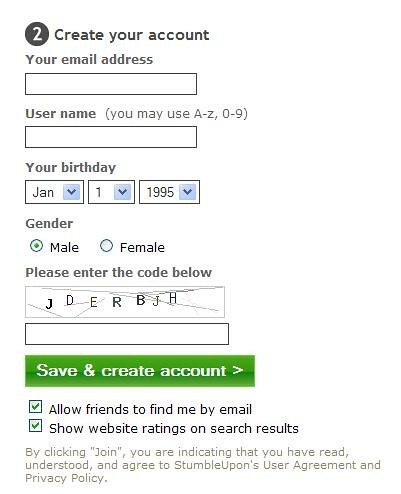 We could also add people from our e-mail address books. Again, we can come back to this step later. Look at that list! I mean seriously, that’s a huge list! 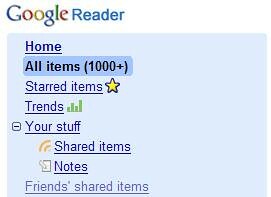 Uh-oh – so far I haven’t paid attention to my “shared items” page. Where do I find that? 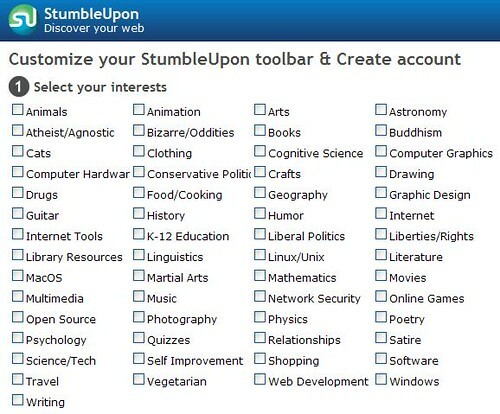 I just add my username and click the “Import StumbleUpon” button. That was easy. How about another? 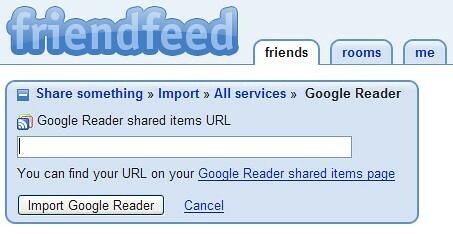 Seriously, that’s it – now whenever I update anything on any of those services – it will show up on my Friendfeed. I could keep going – but I think you get the idea. You can always come back and add services as you start using them. 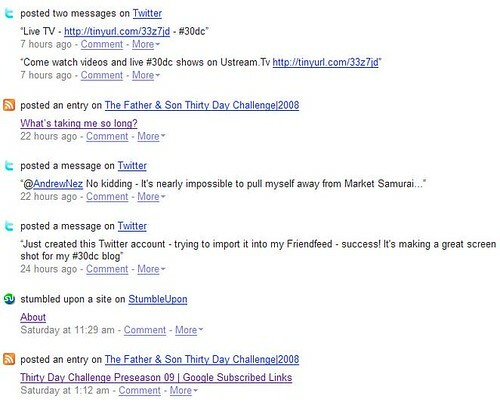 So – I do something in Twitter, and it gets picked up by Friendfeed…. So in looking at Ed’s page, you can see he follows several people and a lot of people comment on his items. 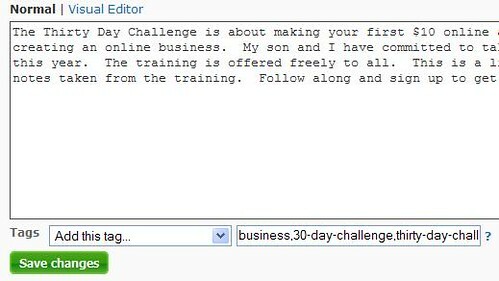 Let’s take a look at the “rooms” functionality – using the “Thirty Day Challenge” room. You can click the image above to go to the Thirty Day Challenge Room. You can join the room – go ahead, join the room…the link is over on the right hand side. You can take this little link (pictured above) and use it to share items to the thirty day challenge room. Everyone gets an opportunity to contribute and jump into the conversation. 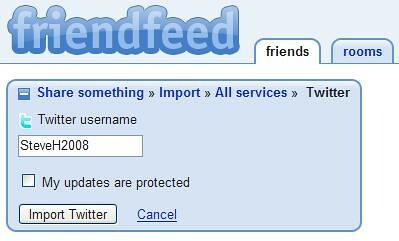 Here’s the important thing – everything in Friendfeed is…..drumroll please…. an RSS feed. 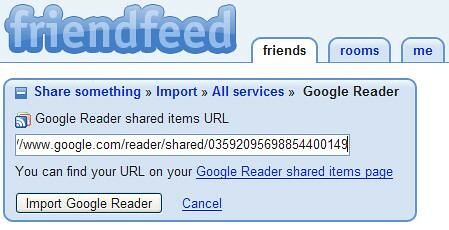 So you can add feeds from Friendfeed into your Google reader. 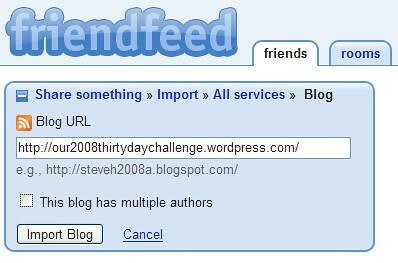 We’ll be learning even more killer ways to use Friendfeed for our internet marketing endeavors throughout the thirty day challenge. Ed encourages every team to create their own room – all the members of your team can interact and share. It’ll become a one-stop-shop for everyone to keep track of each other, their activities, and the sites they’re looking at. And with the commenting capabilities, the feed capabilities and the privacy options – it’s very powerful. It’ll be something to get used to, but it will be absolutely worth it. Remember, once you create your team room – you can subscribe to your feed and interact with your teammates directly from Google Reader. Nice! 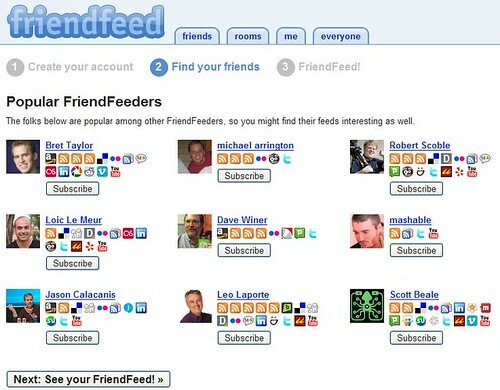 So if you haven’t done it yet – go get signed up for Friendfeed and start getting used to it. 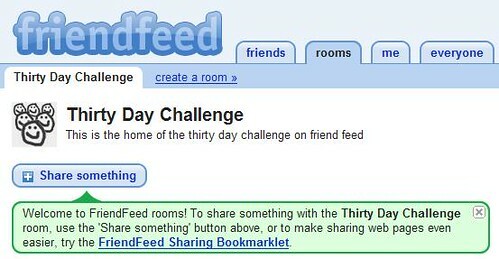 Share a few things like your Twitter, maybe your Google Reader – join the Thirty Day Challenge room and subscribe to Ed’s Friendfeed page. 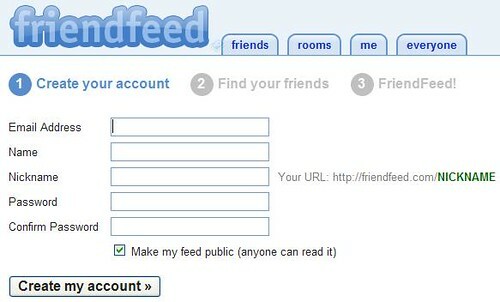 The next lesson will take us deeper into Friendfeed….